Asian carp are a tremendous threat to the Great Lakes and could devastate the lakes if they enter our Great Lakes ecosystem. 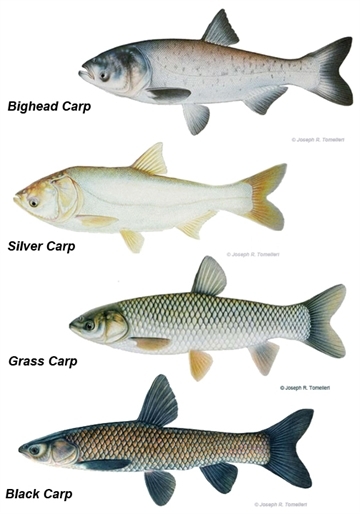 The Asian carp includes four species: black carp, grass carp, bighead carp, and silver carp. Originally, Asian carp were introduced to the United States as a management tool for aqua culture farms and sewage treatment facilities. The carp have made their way north to the Illinois River after escaping from fish farms during massive flooding along the Mississippi River. Due to their large size, ravenous appetite, and rapid rate of reproduction, Asian carp pose a significant threat to the Great Lakes ecosystem by consuming large quantities of phytoplankton and competing with native fish for habitat. Steadily, the carp have become the most abundant species in some areas of the Mississippi, out-competing native fish. Asian carp can grow to an average of four feet and 100 pounds, and can consume up to 20 percent of their body weight in plankton per day. Carp have shown an affinity for becoming the dominant large fish species over more desirable native species or established fish that are recreationally and economically important. Asian carp aggressively out-compete and eventually displace native fish altogether. With no natural predators and the ability to produce 2.2 million eggs, the Asian carp could devastate the Great Lakes' multibillion dollar fishing industry. In addition to the threat Asian carp pose to Great Lakes fisheries, carp also pose an actual physical threat to boaters. 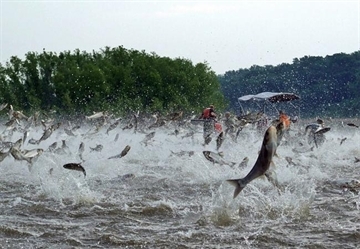 The silver species of Asian carp can leap out of the water creating a hazard for boaters and water-skiers as the fish crash into boats, hitting people and damaging equipment. 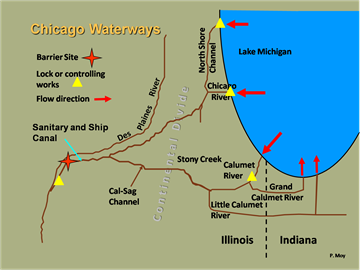 The Chicago Ship and Sanitary Canal connects the Mississippi River to the Great Lakes. In attempt to prevent the Asian Carp from entering the Great Lakes, the United States Army Corps of Engineers (USACE) erected a dispersal barrier system on the Chicago Sanitary and Ship Canal. The electric barrier on the canal is designed to repel the carp back from entering Lake Michigan. Ultimately, the permanent solution is to restore the ecological barrier between the Great Lakes and Mississippi River Basins to prevent invasive species from moving back and forth between the two bodies of water. Studies are underway to evaluate separating the Great Lakes and Mississippi River Basins. 1970s: Asian carp were introduced to the United States as a management tool for aqua culture farms and sewage treatment facilities. The carp have made their way north to the Illinois River after escaping from fish farms during massive flooding along the Mississippi River. 2002 - 2011: In attempt to prevent the Asian Carp from entering the Great Lakes, the Army Corps of Engineers erected a dispersal barrier system on the Chicago Sanitary and Ship Canal. The electric barrier on the canal is designed to repel the carp back from entering Lake Michigan. There are three electrical barriers: Demonstration Barrier, Barrier IIA, and Barrier IIB. The Demonstration Barrier has been operational since 2002. Barrier IIA was placed into full-time operation in 2009 and Barrier IIB was activated in April 2011. The Demonstration Barrier and Barrier IIB are in continuous operation, while Barrier IIA is in warm standby. 2010: The USACE launches the Great Lakes and Mississippi River Interbasin Study (GLMRIS) to explore options and technologies, collectively known as Aquatic Nuisance Species (ANS) controls, that could be applied to prevent ANS transfer between the basins through aquatic pathways. The current project schedule calls for a recommended plan for Focus Area I of GLMRIS, the Chicago Area Waterway System (CAWS), in 2015. However, in June 2012, Congress passed the transportation bill which included a provision requiring the USACE to come up with a plan in 18 months to prevent Asian Carp from entering the Great Lakes. 2012: The study by the Great Lakes Commission and the Great Lakes and St. Lawrence Cities Initiative “Restoring the Natural Divide: Separating the Great Lakes and Mississippi River Basins in the Chicago Area Waterway System” shows that separating the Great Lakes and Mississippi River basins to prevent the spread of Asian carp and other invasive species is feasible both technically and economically. The Department of Fisheries and Oceans Canadian released a study affirming that all five Great Lakes are hospitable to Asian carp and that once established the non-native fish will likely disrupt the native fishery, alter the ecosystem, and create another food web. The study found that it would take as few as 10 female and 10 or fewer male Asian carp of reproductive age to reproduce in the Great Lakes. 2013: The Asian Carp Regional Coordinating Committee (ACRCC) released the 2013 Asian Carp Control Strategy Framework. The Framework builds upon on the comprehensive plan the Administration created in 2010 to prevent this invasive species from developing self-sustaining populations in the Great Lakes. The Framework adds several initiatives to the proactive effort to combat Asian carp, including testing and deployment of new physical and chemical control tools, strengthening the electric barrier system in the Chicago Area Waterway System, and constructing a new project to physically separate the Great Lakes and Mississippi River basin at Eagle Marsh near Fort Wayne, Indiana. The Framework can be accessed athttp://www.asiancarp.us/news/2013framework.htm. 2014: The U.S. Army Corps of Engineers released the Great Lakes and Mississippi River Interbasin Study (GLMRIS) Report.The GLMRIS Report presents options for preventing movement of Asian carp and other invasive species into the Great Lakes from the Chicago waterways. Two of the alternatives evaluated include hydrologic separation with physical barriers to restores the natural Great Lakes-Mississippi River basin divide. A single sample of DNA from a silver carp was discovered in the Kalamazoo River in Michigan. The sample, taken in July, represents the first time that Michigan has experienced a positive result for silver carp eDNA in Michigan’s Great Lakes waters outside of Maumee Bay. Silver carp DNA was also found in the Fox River, a tributary to Lake Michigan in downtown Green Bay, Wisconsin. This is the second eDNA discovery in Wisconsin.